This is the project that every architect dreams of (or should, at least). With designers as clients, visually striking product, and close involvement from the start, Tom Shea and Farnaz Mansuri of De-Spec were able to develop a concept for Chilewich from the ground up. The close collaboration between Chilewich and De-Spec began with the De-Spec–designed artisanal chocolate shop XOCOLATTI, a previous Building of the Day and 2012 AIANY Design Award winner. 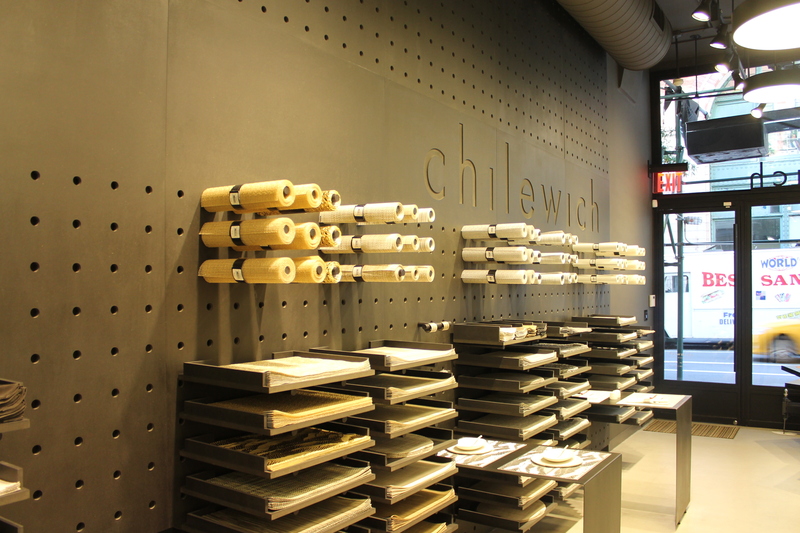 The shop caught Sandy Chilewich’s eye as she walked past its Soho storefront a couple of years ago. 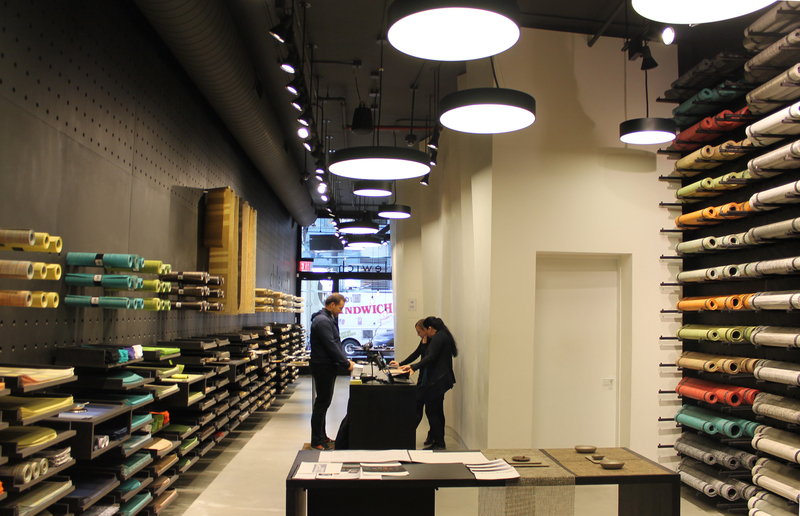 She and her husband/business partner Tom Sultan got in touch with the firm, asking it to develop a concept for what would become their first brick-and-mortar store – and a 2015 AIANY Design Award winner. A matrix of movable pegs displays the merchandise as a network of points and lines. Brightly-colored tablecloths, runners, and rugs pop against a matte-black MDF surface. The simultaneously soft and fractured surface of a long wall running behind the register contrasts with the adjacent grids, and keeps the store from appearing cluttered. Any display space that is lost is more than made up for by a similarly well-organized basement. 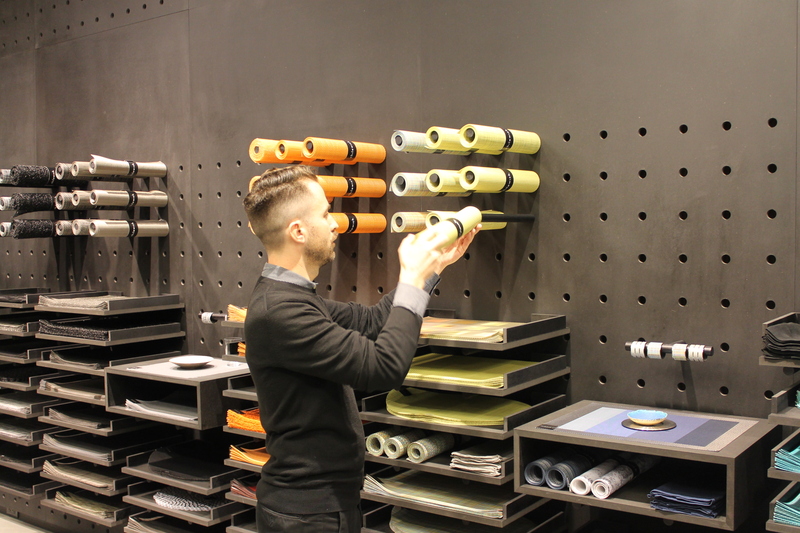 De-Spec also designed the store’s furniture, which is rearranged every few months to show off new products. 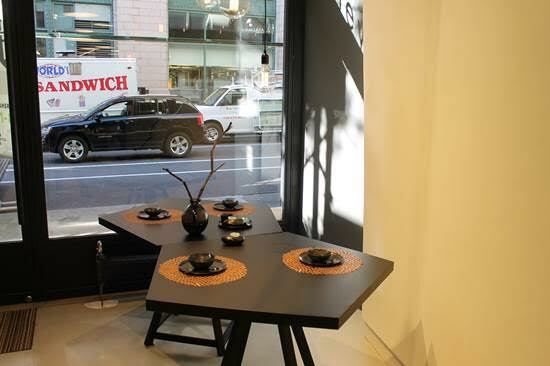 A pair of pentagonal tables visible from the street offers an intentionally awkward canvas for place settings, and lends a touch of quirkiness to the display. Although the peg system is not changed all that often, it’s nice to know that it can be tinkered with. Because the designers came up with the concept before the site was selected, they know that its bones can be replicated in new spaces if the company decides to expand its collection of retail stores. Fun fact: The Ramones’ first performance, with tickets at $2, took place here. Something to think about the next time you’re shopping for table linens. Join us tomorrow for this year’s final Building of the Day: SculptureCenter in Long Island City.